When we go out to eat, or we go grocery shopping, we tend to be very mindful about the type of products we purchase to put into our bodies. This is especially true if you are dieting. We tend to understand which ingredients contribute to our overall well-being, promote burning fat, encourage healthy immune systems, etc. Once we find something is bad for us, what we don’t do is purposely ingest it regularly. Another thing many of us do not do, is take this kind of consideration when deciding on our dog’s diet. Dogs have smaller bodies and are much more prone to diseases and ailments when the diet is not properly regulated. So when we do not understand what we are putting in their bodies, we could be doing far more harm than any good we could do. If we put them down the path of unhealthy habits, it’s hard to have them bounce back. But not impossible. The first step is to find out how to properly shop for food for your dog when you decide you’d like to be more mindful of what’s going in and what’s coming out. Take a look at these great resources to help you decide on the best dog food. What Does “Good” Dog Food Have? The hardest thing about shopping for dog food is understanding what should be in there and what shouldn’t. The first thing to remember is the ingredients will read from highest concentration of ingredients to the lowest. This means if your first ingredients is a kind of meat, it’ll have more meat than anything else, which is a great start. If the first ingredient is some kind of filler ie. Corn, barley, wheat, etc. these are harmful ingredients and will be higher in quantity than ingredients that are actually good for your dog. Look for complete nutrition. Dogs eat the same food every day, so it’s imperative whatever they are eating has everything they need. A great start to know if all nutrients are present is to look for AAFCO statement on the label. Make sure there is whole meat or a specified meat with meal after. Meal is just deprived of water. So if there was lamb-meal present, that means the lamb has been voided of water so there’s just the meat left. If the meat is not specified and it says meal, that’s most likely not great for your dog to consume. Fillers or low quality grains are also very bad for your dog. Make sure some of the first ingredients don’t contain corn or whole grains. Rice and barley are okay and better ingredients to look for. Natural preservatives are okay to have, but nothing synthetic or manufactured. No preservatives are better, but if there has to be some present, avoid BHT, BHA and/or ethoxyquin. These are chemicals and very bad for your animal if ingested over time. 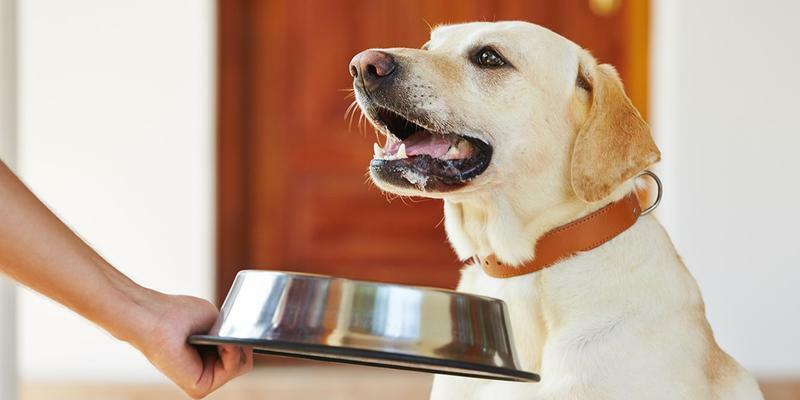 There are different options to consider feeding your dog and some experts believe a combination of all 3 would be ideal. Dry food is good for your dog’s teeth and makers can put more vitamins and minerals in the food. It tends to last longer, but that could be due to the preservatives. As we mentioned above, you’ll want to be mindful of the preservatives used. Canned food tends to be higher in protein and lower in carbs. It doesn’t have any preservatives because the can acts as a natural preserver. It won’t strengthen your dog’s teeth nor will it strengthen your pocket book. Canned food is much more expensive than dry food, but could be healthier. Raw food is the best food you can put in your dog’s diet. It’s all natural, you know exactly what’s going into your dog’s body and there’s no guessing. This is obviously the most expensive choice, but the best choice for your dog’s overall health. You can buy raw food already packaged and dehydrated or frozen. Next time you shop for your dog’s food, shop with confidence knowing you are putting the best and healthiest ingredients in your dog, for them to live a long and happy life.